Dr. Halberstadt provides Invisalign & Invisalign Teen in Queens, Bronx & Rockville Centre, NY. Free consultation appointments for new patients. Dr. Halberstadt provides invisalign in Queens, Bronx and Rockville Centre, NY orthodontics offices. 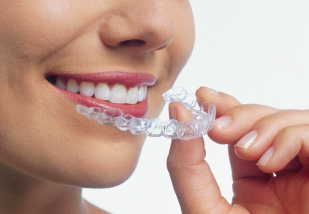 Invisalign treatment consists of a series of custom-made aligning trays. Dr. Halberstadt changes the trays every few weeks to fit the new tooth configuration. In addition to the reduced visual impact, Invisalign aligning trays can be temporarily removed for important occasions – meaning that treatment duration is patient-controlled. A great number of people report complete satisfaction with both the Invisalign treatment and the stunning results. One of the primary concerns people often have about dental braces is the aesthetic impact of the metalwork on their smile. Especially for adults, the prospect of wearing unattractive metal braces for long periods of time can be very discouraging. Invisalign offers an almost invisible aligning system that straightens teeth fast and contains no metal. Now teens don’t have to worry about embarrassing metal braces in their yearbook photos or Facebook profiles – introducing Invisalign Teen! Invisalign Teen is the clear way to straighten teeth without metal braces, using clear aligners. Aligners are removable and virtually invisible, which means you can straighten your teeth without anyone knowing; and you can still eat and drink what you want. Also, you can brush and floss normally to maintain healthy gums and teeth; and there are no wires, metal or brackets to cause mouth abrasions. Invisalign went to leading orthodontists, parents and teens themselves to custom-design an Invisalign system just right for the dental needs of teenagers. With blue-to-clear color-changing aligners to show how long each aligner has been worn, six free replacement aligners in case some are lost or broken, and other changes designed to accommodate growing mouths, Invisalign Teen is the perfect teeth-straightening system for today’s teens’ busy lifestyles! As an adult, you need to feel confident that you look your best. Invisalign allows you to feel that way throughout the entire treatment process. Adults need a subtle remedy, and Invisalign aligners provide the best of both worlds — virtually invisible when you're wearing them, and removable when you need them to be. For these reasons, Invisalign could be the perfect solution for you. Often adults feel that teeth-straightening is too much trouble, too embarrassing or too disruptive. While doing nothing might seem to be the easy choice, making the decision to get Invisalign treatment could benefit you in many ways: straightened teeth and a beautiful smile in a reasonable amount of time, no feelings of self-consciousness during treatment with the nearly invisible aligners, and minimal impact on your busy schedule. Invisalign corrects the same dental problems as traditional metal braces; the only difference is that Invisalign trays are almost invisible to the naked eye, and can be removed when needed. What advantages does Invisalign offer over traditional braces and veneers? Traditional dental braces, Invisalign aligning trays, and dental veneers are three different ways to perfect the alignment of the teeth. There are many different considerations to make when deciding which treatment will be best, and each of these options works better in certain situations. Invisalign differs from traditional braces in that the aligning trays are fully removable. This means that more discipline and commitment is required from the patient. This is not usually a problem since the trays are comfortable and nearly invisible. Almost identical results can be obtained by using either treatment. Invisalign is preferable to veneers in many cases because unlike veneers, Invisalign actually straightens the teeth. Veneers are thin covers that the dentist permanently affixes to the teeth. Teeth must be etched beforehand, meaning that to remove dental veneers, an alternative covering must be constructed. In addition to being somewhat expensive, veneers can break and often last for less than 20 years. First, Dr. Halberstadt needs to devise an initial treatment plan before creating the special aligning trays. Three-dimensional digital images are taken of the entire jaw. These images allow the orthodontist to move specific teeth on the screen, view the jaw from different angles, and also foresee what the face might look like in years to come. In essence, this technology can show how Invisalign trays will change the facial aesthetics. Once planning is complete, a unique set of aligners is made. The total amount of aligners required varies with each individual case, but 20-29 sets per arch is typical. Dr. Geoffrey Halberstadt, orthodontist in Queens, Bronx and Rockville Centre, NY. Providing Invisalign, braces, clear braces and dental sleep aligners.